I have owned NixNews.com for some time and until the last few days it has existed purely as a Linux news river. Originally built on WordPress with RSS aggregator plugins, NixNews grabbed Linux and open source from all over the internet and compiled the links in one place while linking back to the original posting site for reading. The downside to this form factor was that it was nearly impossible to moderate and duplicates appeared more often than not in the river with large streams of posts from one site or another resulting in an uneven mix of news. After initial testing and tweaking, NixNews.com has been reborn into a user voted Linux news and article site. I have tagged it beta, and it just that, an early beta service that will still have bugs to be worked out. I have taken the testing as far as I can go on my own and am opening it up and announcing it’s release. Please take the time to visit, register, vote/bury the stories, and submit new posts. 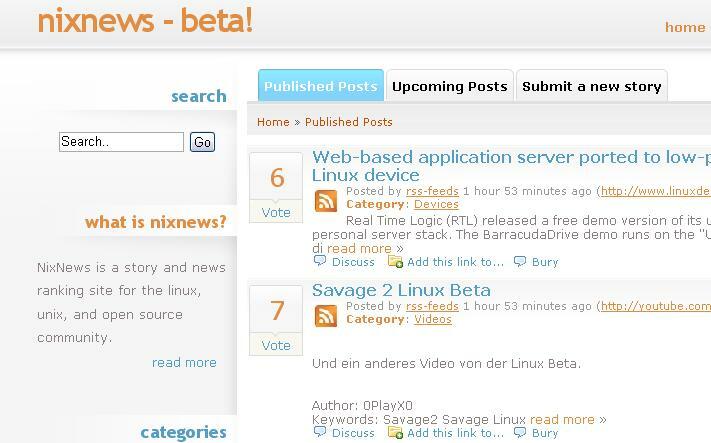 I would like to see NixNews grow in it’s niche as a valuable resource for information to the Linux community. I welcome your bug reports as well as any suggestions you might have for it’s function, interface, design, or feed aggregation.